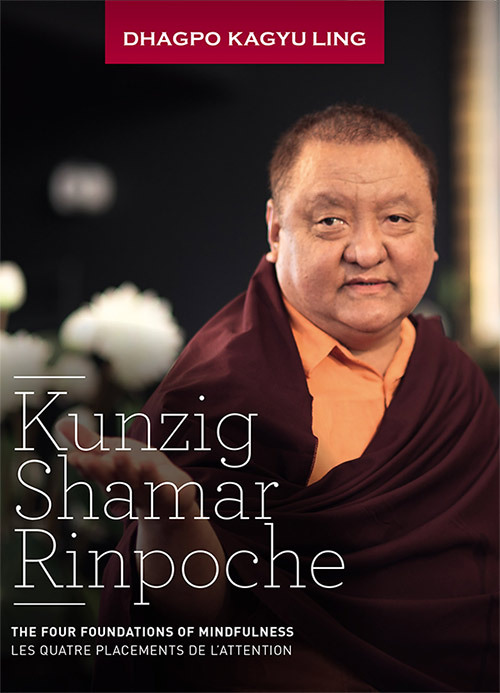 “Teaching on the Four Foundations of Mindfulness” by Kunzig Shamar Rinpoche at Dhagpo. During his last visit to Dhagpo, Kunzig Shamar Rinpoche particularly insisted that his teaching take place in the Institute. We never imagine it would be his last teaching. The life of living beings is naturally not in ultimate happiness. Sometimes you have short time happiness, but it will change. Inevitable… change is inevitable. You can also find a recording of the 49 days of funeral ceremonies as a supplement on the DVD and on the page Resources/videos. This teaching focuses on the four objects of mindfulness. These four objects or foundation for developing awareness are a very important subject, whatever our approach to Buddhism is: whether we are practitioners of the common teachings of Buddhism, the Shravakayana, or the great vehicle — Mayahana, the way of the bodhisattvas. It is equally important in the teachings of Vajrayana. The four objects of mindfulness are the body, sensations, mind, and phenomena. What is the meaning of “object of mindfulness,” (drenpa nyewar shakpa in Tibetan)? It concerns the observation of the specific characteristics of the body, sensations, mind, and phenomena, to recognize their true nature, their reality, and to keep this in one’s mind. It means to maintain awareness of what the body, sensations, mind, and phenomena truly are. Let's look at the application of mindfulness to the body. Our general idea is that the body is somehow pure, it's a source of pleasure, that it is somehow permanent, and that it is the self or related to the self. We identify with it. The idea that we have about what our body is does not correspond with the reality of our body. We've been grasping the body as being something which it is not. We take the body to be pure, permanent, to be a base for happiness, to be the self, where in fact it is impossible for the body to be these things because they do not correspond with its fundamental characteristics. So we use this practice to look at the real characteristics of what the body is. We look at it very carefully, and by using the practice, we see that the body is not pure, that it is actually the basis for suffering and not pleasure, it is ephemeral, not permanent. It is not a self, we can't identify with it because there is nothing solid to identify with, there's no ultimate existence within the body. By observing the true characteristics of the body, looking at its true nature, it is possible for us to break apart and pierce through our misunderstanding about what the body is, and thereby break the grasping that keeps us turning in samsara since we will have recognized the illusory nature of the object that we have been grasping in terms of characteristics that it does not actually have.There are two aspects to this observation of the body. The first one is to eliminate our attachment to the body. In order to do this, we look at the body as being quite unattractive. The second aspect involves examining the characteristics of the body and seeing the emptiness of the body, such that we naturally give up our attachment to the body as an entity with an inherent existence, as having substance. In order to be able to do any sort of practice, it is important to calm and settle our mind. All practice begins with the meditation of shamatha, or shine in Tibetan. There are many different methods and ways to put this into practice. The goal is to calm the agitation of the mind. The agitation or dullness of the mind consists of anything that keeps the mind from being sharp, clear and calm. There are quite a lot of different instructions that have been given by masters of the past, whether they are arhats or bodhisattvas on the path, they all stressed the importance of the method based on contemplating the cycles of breath, following the breath, or settling the mind on the breath. All of these are really fundamental instructions for practice that are present in all the types of Buddhism. Settling the mind on the breathing cycles leads us to the result of shamatha, which is the stability that we are looking for. Concerning the body as an object of mindfulness, and more specifically the observation of the reality of the body, the essence of the practice consists of observing that we see our bodies as being ourselves, as the basis of pleasure or permanence, but in fact, none of this is true. There is no ultimate intrinsic reality to our autonomous physical dimension. We can practice this meditation where we scan the different parts of the body, as already explained earlier: “I see the skin, the flesh and the bones, all scattered.” We lead this analysis and we dissect the body and we understand that here is not one thing that we can call a body; it has no substantial existence. There is nothing that we can grasp as one body in the ultimate sense of the term. There is also an auxiliary practice, which is the practice of the visualization of the unattractiveness or ugliness of the body, especially if we are very attached to our bodies, or someone else's physique. If we are feeling a lot of lust or desire, we can do a meditation where we visualize the disgusting aspects of the body and bring those very closely to mind. Essentially, we could say that there are two kinds of sensations: physical sensations and mental sensations. Of course when we talk about physical sensations, it is always mental sensations, but the contrary is not true. These experiences take place in the mind, if there's a pleasant or unpleasant physical sensation, it is experienced in the mind, but the same does not hold for the mental sensations, as they are not necessarily connected to physical sensations. Let's begin with the meditation where we are mindful of physical sensations. We become aware of physical sensations. For example, something itches, we have a headache or we feel good and very comfortable, whether pleasant or unpleasant, we must begin by becoming aware of sensations. Then we become mindful of that sensation. When we choose the physical sensation, a headache for example, we are talking about a small discomfort or small headache, for beginners especially because if we have a raging migraine it will be nearly impossible to use it for our meditation. The beginners can choose an itch, a small headache or any other small discomfort, or small physical well-being or pleasure. We become aware of it and use it as the focus of our meditation. Once we recognize a sensation, we analyze it: we look at it, analyze how it exists, where it is located: to the right or the left? Up or down? What size it takes. What does it look like? What does it appear to be like? Is it big? How big is it? Can we manoeuvre it? Is the sensation fleeting? If it is, where does it go? This analysis shows us that the sensation is characterized by chance as it is not fixed or stable. And thus, we can recognize its elusive nature. There are actually two ways to analyze sensations. The first is an analytical meditation, in which we examine the sensation itself. We ask ourselves where it is. Is it located in the mind? In the body? Is it one with the body? Separate from the body? We ask questions in order to understand what its nature is through logical analysis. The second method consists in going to the very essence of the sensation, of looking at it directly in the moment when the sensation arises. If we analyze or examine sensations in this way, we will be able to distinguish a sensation from our grasping to it. So if we actually look at and practice with sensation in this way, we can then observe our attachment or the grasping to the sensation as being pleasant or unpleasant, agreeable, disagreeable, pain, pleasure. We no longer grasp the sensation or reject it. We thus reach a state of equanimity with regards to what we are feeling. The analysis of sensation allows us to understand the non-reality of sensations on an ultimate level: they have no essence; however their relative nature may be pleasant, neutral or unpleasant, of the nature of suffering and pain. We can distinguish physical sensations, experienced by the senses, and mental sensations, experienced solely by the mind. All sensations are by nature ephemeral, subject to change. They are likewise characterized by suffering, because of this insubstantiality. One cannot rely on pleasure—its nature is to disappear; thus it is a form of suffering because it is subject to change. The teaching on the Four Noble Truths explains that there are the suffering of suffering, the suffering of change, and existential suffering in premise. The painful sensations belong to the category of suffering of suffering, it is a quite obvious suffering. Since pleasant sensations are impermanent, they belong to the suffering of change, painful sensations are obvious suffering and the neutral are characterized by existential suffering. Seen in this light, there are no sensations, on the relative level, that do not imply one of these three sufferings. Existential suffering is always present, but it is extremely subtle. If you take for example physical pleasure, you could say that there might be a pleasurable experience. Even though we may not perceive any sort of suffering, these sensations are marked with an existential suffering. Take the example of lying down on a waterbed. As long as that experience is happening, and we haven’t gone into the change where it turns into suffering, even while we are experiencing pleasure, we have this subtle undertone of the existential suffering that we are generally not aware of. If existential suffering were not present, continuously, both on the physical and the psychological levels, then we would not experience the grosser levels of suffering. We can see that suffering comes from the grasping we generate. This grasping is constant. There is no discontinuity in the grasping, leaving no place for liberty. It is like a highway. You look at a paved highway and it looks like it is completely continuous and uninterrupted. This is the grasping. It is the persistent subtle suffering. This subtle and constant grasping is characterized by agitation and not calm or peace. Thus, we can see that this inherent suffering, this subtle agitation of the mind, is the opposite of peace or tranquillity. In order to pacify this grasping or the identification, first on the gross level, identifying the self as the physical self, we are going to meditate, shamatha or calm abiding meditation also known as shine. By sitting and meditating, by practicing, we exercise concentration, and we will be able to pacify the agitation, the gross agitation, of the mind.Then progressively we will be able to bring the mind to a certain degree of quietude or pacification. We will be able to have this experience of well-being because in our inner agitation has been truly calmed down. But we can go further in pacifying the mind and cultivating quietude. In fact you can always go further, you can continually go further in pacifying the mind. There are states of well-being that can be developed ad infinitum. It is always possible to go deeper and be more subtle, increasing our stability of the mind. As one goes deeper and deeper into shine, the initial peace and well-being that was experienced seems actually quite gross. This first experience that we have acquired will seem like stability, but we will see that it can be fortified even further as after it will seem rather gross. Applying mindfulness on the mind leads us to recognize the nature of the mind that is grasping phenomena. Placing the mind on phenomena allows us to have an understanding of the true nature of the objects that are being grasped by the mind. If we know the nature of the mind that grasps, we will be able to eliminate the problems of the grasping mind. If we eliminate the problems that are connected to the mind that grasps, then we will naturally eliminate any problems connected to phenomena that have been grasped at. We begin by developing the stability of mind, through shamatha, once it becomes stable and we are quite comfortable in it, and we begin to observe the mind stream itself and the different moments of awareness in the mind stream. Mind is characterized by its ability to be aware. It is described as a sort of luminosity; it is possible for the mind to experience, to know. But these qualities do not mean that we have to be constantly aware of or conscious of something. The mind is a continuum, a series of conceptual instances, or thoughts that is incessant. When we are talking about the mind, we’re talking about the dualistic mind. The dualism that is grasping at itself and because there is a self, there is also everything that is other than a self. Attention on the mind consists in observing the continuum of the mind. Seeing that the moments of the past that existed in the mind no longer exist, and future thoughts do not yet exist either. This being the case, we look at the present moment. Let’s look at this present moment of consciousness and see if it exists. How does it exist? Is it autonomous? Does it have a substance? Does it have a shape? Does it have a color? What is this present instant of consciousness like? We use all sorts of different aspects of what the instant of awareness or consciousness could actually look like to understand just what sort of form that it has, if it has any. Likewise, as soon as there is a thought or a concept that arises in the mind stream, we look at it in the same way. We ask ourselves about its origin, its nature, its existence. When an idea ceases, we move on to the next idea that emerges and apply the same analysis. The words thought, concept, idea, help us to describe the way things appear in the mind. The contents of the mind you could say. Through our sense perception, for example, through the sight consciousness there is perception of a physical object, and this appears. It appears within the mind stream. The perception of the mind is based on perception of something, and we can’t say that perception or ideas or concepts can be separated from the mind. If the concept could be separated from the mind, it would be something material. What is mind? Mind is experience: experience of phenomena and of thoughts. When we talk about observing the mind, we are trying to see the mind as it is, completely, in an autonomous manner, disassociated with everything that is grasped. This is looking at the fundamental nature of the mind itself. If we look at it, we see that there is actually nothing that can be grasped. There is no object, just no concrete object that can be grasped and called mind. The DVD and CD are available for purchase at Dhagpo at Dzambala giftshop and in the library of the Institute, as well as some urban centers near you* (KTTs). and 20€ for the DVD. > All sales profits go directly to the financing of the Institute. With the exception of the writing of the CDs and DVDs, this project was carried out entirely by volunteers.